A massive thank you to Debs over at Super Busy Mum for my Versatile Blogger Award nomination. My first ever award! I am really rather chuffed about it. So much, that I still haven't stopped grinning :-D The Versatile Blogger Awards are a great way of recognising blogs that deserve some recognition. 1) I am a recovering chocoholic. Always recovering. 2) Cooking was a pet peeve until very recently. I am always looking for shortcuts in the kitchen. 3) I am technologically challenged. I cannot even change a lightbulb. There was a time when any electronic equipment would go bust if I so much as ventured near it. 4) A holiday in Majorca has inspired me to take Spanish lessons. Two words so far - Hola, Adios. 5) I love Strictly Come Dancing. I absolutely love to dance, although I am terrible at it. Dancing nowadays is restricted to jumping around with J and going to the occasional Zumba class. 6) I quite enjoy doing puzzles of all sorts. Sudoku, word challenges, logic problems, jigsaws, the lot. 7) I have a bit of an obsessive compulsive streak. Things have to be a certain way, no compromise. The OH often bears the brunt of it. 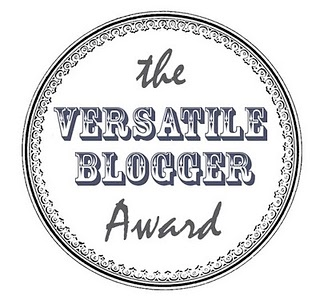 * You must put the Versatile Blogger Award pic on your blogspot. * Make sure to thank the blogger that nomiated you, in your post. * Finally write 7 random facts about yourself and nominate 7 other bloggers.